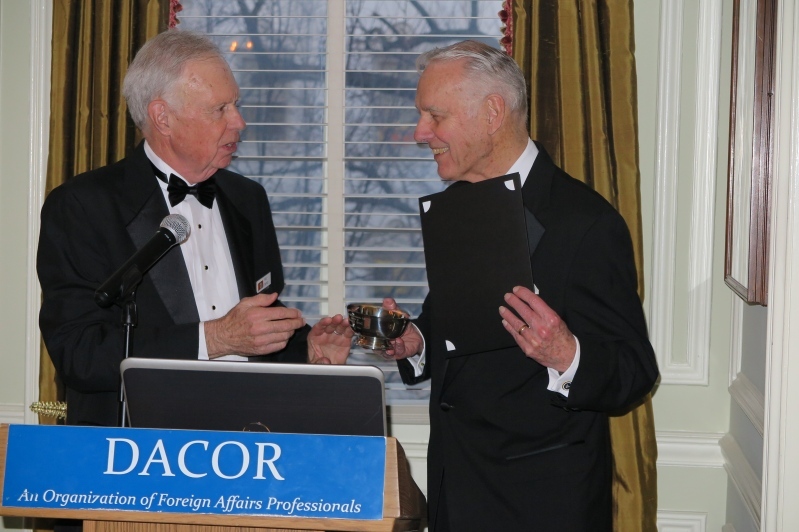 DACOR offers three awards to recognize those who have made signification contributions to the Foreign Service, foreign affairs generally, and DACOR and the DACOR Bacon House Foundation. DACOR awards the Foreign Service Cup each year on Foreign Affairs Day. The award goes to a retired FSO who had a distinguished Foreign Service career and has made significant post-retirement contributions to the broad field encompassed by the term "foreign affairs." It is DACOR's highest honor. Hon. 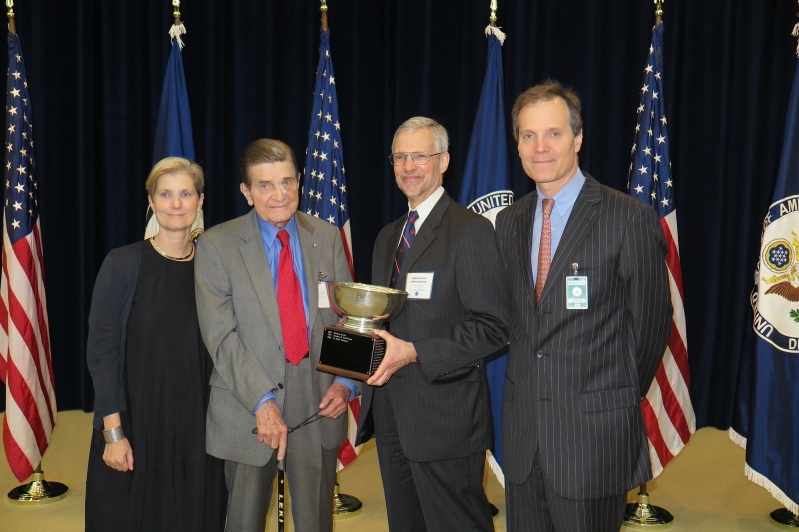 H. Allen Holmes receives the 2018 Foreign Service Cup from DACOR President James Benson. This award is given at the discretion of the DACOR president in recognition of a member who has made exceptional contributions to the organization and the DACOR Bacon House Foundation. Hon. Edward Rowell receives the President's Cup for Exceptional Service to DACOR from DACOR President Raymond Ewing in 2017. The Eleanor Dodson Tragen Award honors a spouse, family member, domestic partner or member of household, who has effectively advocated and promoted rights, programs, services and benefits for Foreign Service families in the tradition of the AAFSW and its members, as did the late Mrs. Eleanor Tragen. For her work to connect Foreign Service spouses through local and virtual networking, blogs, websites and print publictations and to provide resources so that others are empowered to foster mutual support among spouses, partners, and families serving overseas. For advocating for the benefits of FS family members and the local communities in which they reside and work. For creating the AAFSW Foreign-Born Spouse Group. For her work on raising awareness of mental health and resilience issues for FSO families. For his advocacy for the working spouses and partners of FSOs. For his promotion of women, gays and lesbians in the Foreign Service. For her work on behalf of families with special needs children overseas. For her lifelong advocacy of legal and economic rights for FS wives. For her instrumental role in the creation of the Family Liaison Office. For defining and articulating the concerns of FS spouses. 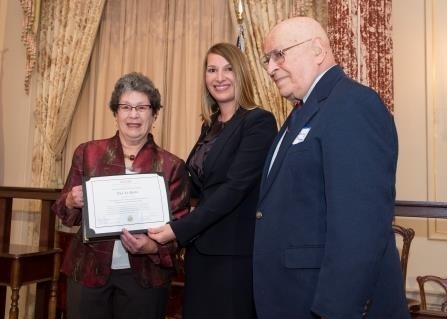 Ms. Ann La Porta receives the 2014 Tragen Award from Deputy Secretary of State Heather Higginbottom and award benefactor Irving Tragen.